At our Bishop Chavasse Primary School site in Tonbridge, we work closely with the local community to ensure smooth relations. Parking was highlighted as a potential issue at the start of the project. On-site parking is not feasible due to the limited space on site. The site also has two other live sites very close by which makes deliveries and on-street parking particularly difficult. Meetings were held with the local authority early in the contract to obtain their advice. Investigations were made into reopening a section of road opposite the site that had been turned into a bridleway for the formation of a temporary site car park. Unfortunately, this was not practical due to security issues. 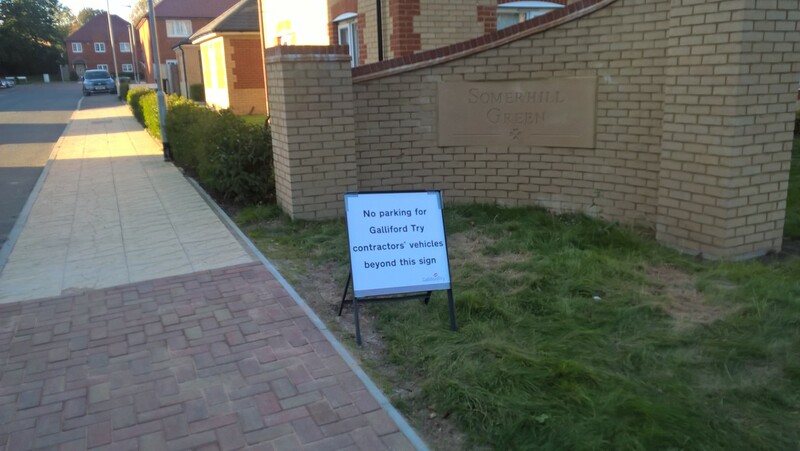 To minimise disruption to local residents, we have made and displayed custom Galliford Try ‘No Parking’ signs. Additionally, during our site inductions, we have introduced a map and a detailed instruction of where the operatives should park to reduce the impact of site parking. The map is also displayed in the canteen, changing rooms and meeting rooms. We have also consistently promoted car sharing to those travelling to work which has seen improvements in congestion in the affected area. Thus, maintaining a good relationship between the local community. We also utilise school staff parking bays whenever possible, such as during school holidays, to minimise any disruption caused.